Feel the difference with our new Hawaiian Spirulina Protein Shake. The first of its kind, this delicious vanilla-flavoured blend of entirely plant-based proteins and caffeine-free energy boosters is designed to help you play hard and recover fast. The Hawaiian Spirulina Protein Shake is closely modelled to follow the World Health Organisation`s standard for ideal daily amino acid ratios, making it the superior choice for supplemental. 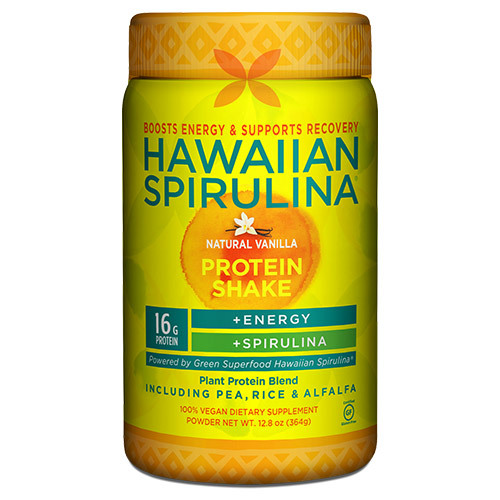 For an easy way to add the benefits of protein and spirulina nutrition into your diet, try the Hawaiian Spirulina Protein Shake. Mix one scoop with 227ml or more of water, milk alternative (rice, coconut almond etc) or add it to your favourite smoothie. Refrigerate after opening to maximise freshness. Answer: As this product is sold into the State of California, it is subject to their state laws. In 1986, California voters approved an initiative to address their growing concerns about exposure to toxic chemicals. That initiative became the Safe Drinking Water and Toxic Enforcement Act of 1986, better known by its original name of Proposition 65. Proposition 65 requires the State to publish a list of chemicals known to cause cancer or birth defects or other reproductive harm. This list, which must be updated at least once a year, has grown to include approximately 800 chemicals since it was first published in 1987. Yams, turnips, apples, tomatoes, artichokes, carrots, cucumbers, green beans,lettuce, spinach, potatoes, corn, and many, many more fruits and vegetables.For instance, carrots contain 12.80 micrograms of arsenic in a one cup serving; green beans contain 28.75 micrograms of lead in a one cup serving, 56 times the allowable limit! Vitamin and supplement products containing all natural ingredients are naturally going to contain these substances. Evidence indicates that any of the above that maybe present is there only as a result of the environmental conditions in which vegetables are grown, and thus occur naturally in the products, including this product. 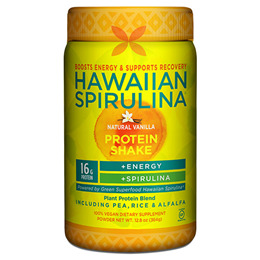 Below are reviews of Hawaiian Spirulina Natural Vanilla Protein Shake - 364g by bodykind customers. If you have tried this product we'd love to hear what you think so please leave a review. As this product is sold into the State of California, it is subject to their state laws. In 1986, California voters approved an initiative to address their growing concerns about exposure to toxic chemicals. That initiative became the Safe Drinking Water and Toxic Enforcement Act of 1986, better known by its original name of Proposition 65. Proposition 65 requires the State to publish a list of chemicals known to cause cancer or birth defects or other reproductive harm. This list, which must be updated at least once a year, has grown to include approximately 800 chemicals since it was first published in 1987. Feel the difference with our new Hawaiian Spirulina Protein Shake. The first of its kind, this delicious vanilla-flavored blend of entirely plant-based proteins and caffeine-free energy boosters is designed to help you play hard and recover fast.